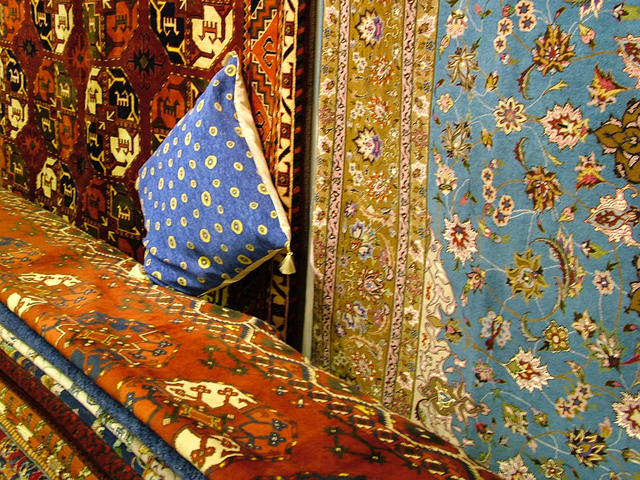 Not only does Arizona Oriental & Specialty Rug Care provide top-notch cleaning service for our clients, we also want to help you make sure your rug stays looking beautiful for a while! One of my favorite ways to help clients do this is through applying soil protectant to their area rugs. Like I’ve said in the past, dry soil is very abrasive and damaging to the fine wool and silk fibers of our area rugs. In fact, it’s just like sandpaper in that it grinds away at the delicate fibers, making them slowly disappear over time and creating wear patterns in your beautiful rugs. So what exactly does soil protectant do? Help protect your rug’s fibers from soiling! Just like the wax protects your car’s paint, soil protectant protects the fibers of your area rug. Gives you a bit more time to blot up any spills that happen on your rug. It isn’t bulletproof by any means and you should always clean up a spill as quickly as possible. But soil protectant does provide you with an extra precious bit of time. Helps your rug’s fibers remain clean for longer! This means you can go a little longer between professional cleanings of your area rugs, so long as nothing major (like a big spill or animal accidents) happens in the meantime. Makes vacuuming more efficient and makes a professional cleaning easier in the future! When fibers have been protected, soil releases from the fibers much easier. If you vacuum frequently, dry soil has less of a chance to work its way down into the base of your rug. Arizona Oriental’s soil protectant is WOOL SAFE CERTIFIED, meaning it is safe for use on all wool and silk area rugs! It’s also safe for any animals and children in the house, too! How great is that! ?